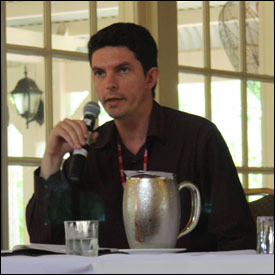 Greens communications spokesperson Senator Scott Ludlam (pictured) today predicted legislation around the Federal Government’s internet filtering project would have to wait until after the next Federal election. “I predict that the filter legislation wlll not be on the table before the election,” Ludlam told journalists at the Kickstart conference in Queensland today. Ludlam said the Senate at the moment “could politely be described as constipated”, due to what he claimed was Opposition attempts to delay and “block everything” passing through the upper house. The Greens senator described the political action as “quite a destructive move” on the Opposition’s part. In a wider sense, Ludlam said he thought the Government had really “mis-stepped” by pushing the filter initiative. He said the Government’s “inflexibility” attempting to just crash through with its agenda had lost them support. “They are probably just going to have to think again about that,” he said. Prime Minister Kevin Rudd this week said the Government wouldn’t apologise for pushing ahead with the initiative. The Greens senator has quite a lot on his communications portfolio at the moment, with Communications Minister Stephen Conroy having recently published exposure drafts of legislation relating to the National Broadband Network Company, and also planning legislation around the break-up of Telstra. But he said the filter debate remained “the single biggest issue” for him. “It’s something I’ve been pursuing and will continue to do so until it gets resolved,” Ludlam said. Last year the politician described the policy as “pointless” and “misguided”. Ludlam believed that the Telstra legislation, on the other hand, would get through before the election, despite one attempt by Conroy to introduce the bill into the Senate being shot down in flames last week. At the time, Greens senator Rachel Siewert had said her party was ready to debate the legislation. In early February, Labor Senator Kate Lundy had said she believed the filter legislation was on track to be introduced into parliament in the late February/March time frame.